1. Focus on connecting people: We call our get-togethers meetups – instead of off-sites or retreats – because our primary goal is to get everyone on the team to meet and to get to know each other better (not to get away or retreat from our office). We’re distributed (mostly working from home), so in-person meetups are especially important for us, but I think it would be beneficial to any company to get everyone together once or twice a year to spend time with each other to deepen personal connections and get to know the “people behind the jobs”. 2. Make it a hack week: From our very first meetup of 8 people all the way through to last week’s at 122 people, we’ve always spent a good portion of the week co-working on projects and launching them at the end of the week. With a small team it was everyone working on tasks from our then current to do lists. As our group got bigger, we started having more planned out projects for multiple teams. The projects are designed to be interesting to the group, have components that everyone can contribute to, and be small enough so they can be launched quickly to get a sense of achievement and completion. Most recently we’ve refined the model to ask people to suggest project ideas ahead of the meetup, then create teams based on those ideas with the goal of mixing people who usually don’t work together into teams and letting people lead teams who haven’t done so in the past. Other than launching cool stuff (we have a demo session for all the projects at the end of the week that is super fun), the projects have the obvious benefit of people getting to know each other by brainstorming and building things together. 3. Have everyone give a flashtalk: When our meetups got to about 40 people we introduced the idea of having team members give short talks to the whole group about a subject of their choosing. The talks were a huge success and we’ve now made them a permanent part of our week. The rules are simple: Present to the group, 5 minutes maximum, any topic, everyone has to give a talk. We do a morning session and an evening session of talks (we’ve gotten good at getting everyone’s presentation loaded onto a single laptop and strictly enforcing the 5 minute rule so it all moves along swiftly). The talks end up being a fascinating mixture of people talking about hobbies, families, work habits, diets, books, things they’ve recently gotten passionate about, and much more. Everyone is nervous going into it and relieved when their turn is done (the audience is super supportive, so most people feel like wanting to give another talk after their first one). We all bond and learn interesting things about each other in the process. Everyone in our company seems to cherish these talks (we video them for our archives). 4. Have people organize activities: The third big element aside from hack projects and flashtalks are activities. This includes group outings as well as talks and workshops on topics of interest. Most of the outings are self-organized (someone from the company will take the lead on it) and range from hiking to go-karting, baseball games, skydiving, horse back riding, you name it. Whatever is nearby and of interest to a part of the team. 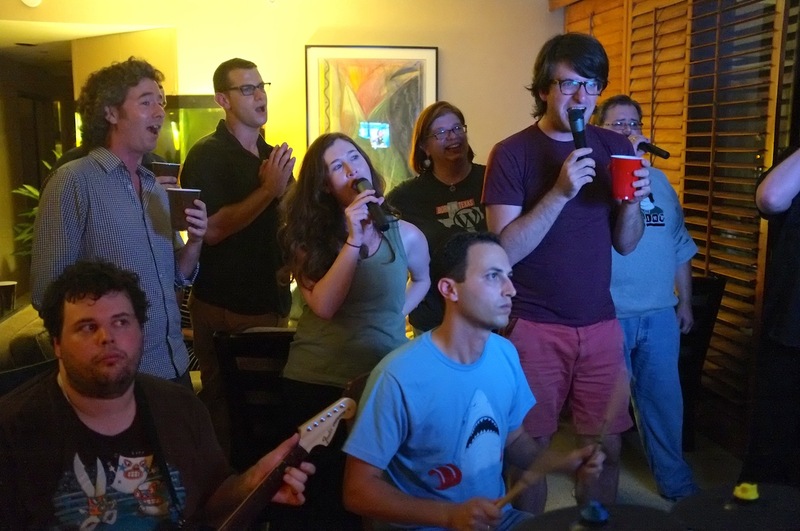 There were Wii Tennis marathons in the past and Rockband and Karaoke ones more recently. The workshops and talks range from work related (learn about CSS, etc) to town halls (company meeting and Q&A) and occasional guest speakers (Tim Ferriss came to visit us in San Diego). We still struggle with finding enough time in the week to do all of the above. One thing we learned is to tell everyone at the beginning of the week that it’s OK to miss things during the week and to ask the project teams to scope their projects so they can be done with a few hours of work a day (so people don’t end up cramming on the projects all week and missing out on the rest). 5. Keep a tight schedule: We find it important to come up with a pretty tight schedule to make room for everything. We publish the schedule a couple of weeks ahead of the meetup so people know what to expect. In San Diego we started at 8am with breakfast, 9-10:30 flashtalks, 10:30-2:30 project time (with a break for lunch), 2:30-5:30 activities, 5:30-7 more flashtalks, 7-9 dinner, 9-? social time. 6. Take a photo: This may be obvious, but we take a group photo at every meetup. It serves as our company photo for the year and having a bunch of them from over the years is really nice. We have the whole series up in our San Francisco office and we send a copy of the most recent one to new team members as part of their welcome package. 7. Pick a good venue: This may also be obvious, but it’s easier said than done. What has worked best for us is one of two types of venues: 1. A place like Seaside that offers groups of large homes for rent and a central meeting area so each project team can share a house to stay and co-work in and flashtalks, meals and workshops can be held in the central location (warning: Seaside can get boiling hot) and 2. A place like San Diego where we take over most of a hotel that has good conference facilities where the teams share suites for co-working and the conference areas for whole team activities. There are also the obvious considerations of being easy to get to/fly into and having easy access to things to do and restaurants (important as the group gets bigger). From small to big, other examples of venues we’ve been to are La Paz, Stinson Beach, Oracle, Quebec, and Budapest. 8. The internet always breaks: We have yet to find a venue where the internet doesn’t break when we get there and the whole team fires up their various devices (of all the places we’ve been to, Quebec had the best internet). This usually happens after each venue swears up and down that they are ready for a group of our size. We then spend half the week fixing things and finding work-arounds. We’re to a point where we are considering bringing our own setup with us (and ordering our own dedicated line/connection ahead of time). Retreat center type venues are especially bad about this because they are set up for groups who are trying to get away from their day to day devices (not us!). If a venue became known among technology companies for having amazing connectivity, they would be booked solid for years for tech related events and meetups. Alas, we’ve not found that particular Shangri La. So that’s it. Your handy guide to a great company meetup. I had a fantastic time last week in San Diego and I think the rest of the Automattic team did as well (feel free to chime in 🙂 ). It’s a big undertaking to take your whole company somewhere for a week, but well worth it IMO. PS: As far as costs, we end up spending about $400 per person per day (not counting travel expenses) with roughly 40% on lodging, 40% on food, and 20% on activities and extras. PPS: Automatticians are starting to post photos from our San Diego meetup: Chexee, Koke, MacManX. I can testify first hand that those work. I, for one, had an amazing time, both on professional and personal levels! I'm in love with your 5-minute "flashtalk" on any subject idea. Brilliant. As I drag my feet in posting my own recap (and about a bazillion photos!) from the recent Automattic meetup, Toni’s post will do nicely (and I’m in the photo too!). Great wrap-up and insight post about the @Automattic company meetup I just came back from, by our CEO @tonidotorg. "We have yet to find a venue where the internet doesn’t break when we get there"
Great write-up Toni! This was my fourth Automattic meetup and definitely the best yet. While the schedule feels hectic, and I often found myself running from one thing to the next, it really helped to keep things moving and avoid getting "stuck" on any one thing. I love the flash talks, so I'm wondering how they're possibly going to scale for the next meetup, which no doubt will involve a bunch more people! For my fourth time around, I must say that Automattic meetups just keep getting better and better. The well-planned out schedule and projects are key. This blog post has been verified in person 😉 That’s where I was last week! Great advice for nurturing a great community of talented and diverse individuals! Automattic’s CEO Toni Schneider wrote a great recap on how your company can meet-up the way we do. Even for this weary traveler, the Automattic meetups are always one of the highlights of my year. A great write-up about how a company should do a meetup! I enjoyed it a lot – both the meetup and reading the post! I’ve been hosting entrepreneur retreats for the last year now in Thailand and Costa Rica, and I find they’ve been hugely impactful for everyone who has participated. It’s humbling and exciting to get such consistent, fantastic feedback, and it creates a unique environment to brainstorm, to get a bit of a break and a relax, and to rejuvenate those motivation juices!